The other day I was in a HUGE dilemma. 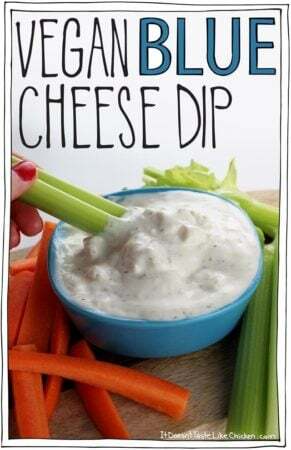 I wanted to eat a healthy salad, but I was craving my Vegan Blue Cheese Dip. Ok, ok, so this dilemma is not that huge, but this is what happens when you spend 90% of your time thinking about food. I’m all about indulging those cravings, but when it comes to salad, I do prefer it to keep it on the healthier side of meals (it is salad after all). 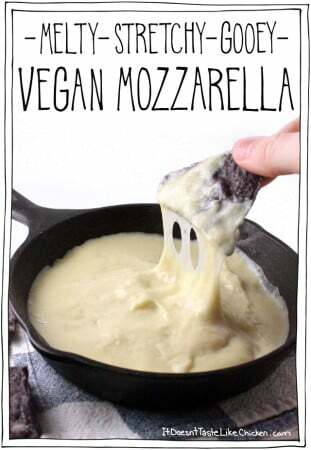 And although it’s super delicious my vegan blue cheese dip wouldn’t be the healthiest option. So I did what any logical vegan blogger does, I made a new recipe. 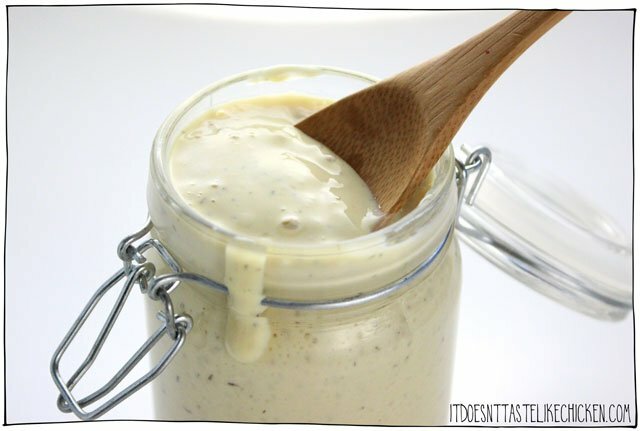 Easy Vegan Blue Cheese Dressing. 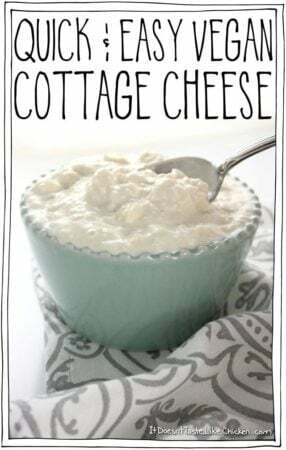 It’s creamy, tangy, healthy, oil-free, only 33 calories for two heaping tablespoons, and of course, super easy to make. Instead of vegan mayonnaise, I use soft or silken tofu in this recipe. Soft tofu lacks a lot of oomf so I had to bump up the flavours of the dressing to the perfect level of vegan blue cheese dressing tanginess. A little playing around, and success. Ooooeeee is it good! Mission complete. 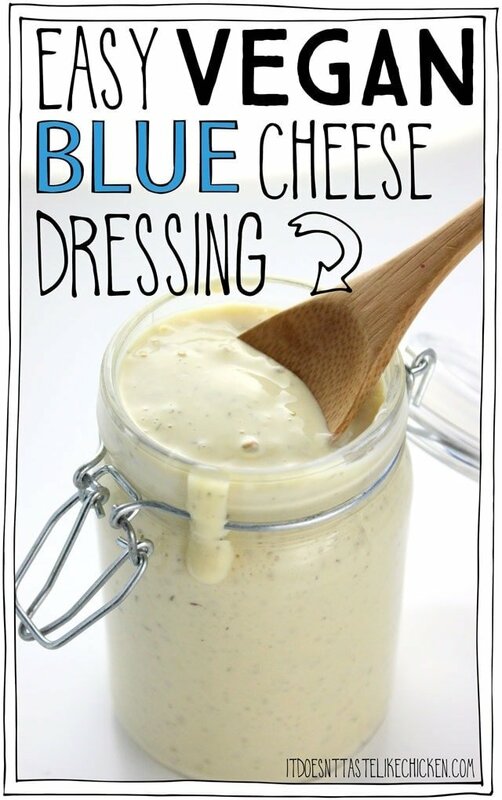 To make easy vegan blue cheese dressing: add all the ingredients, except the dill and crumbled tofu, to a blender and blend until smooth and creamy. Now you can add the dill and crumbled tofu (if using), and stir or pulse a few times to combine. That’s it! Done! Finito! Easy. I opted for a smooth dressing texture, but adding in crumbled tofu to the dressing will add a crumbled cheese texture. 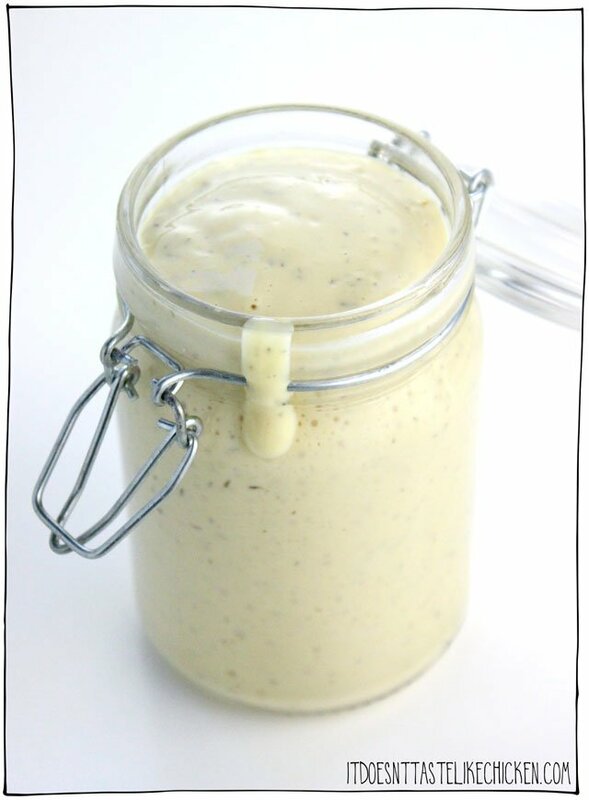 The dressing can be stored in an air-tight jar in the fridge for up to one week. Pour over or toss into your favourite salad. Add the soft tofu, nutritional yeast, apple cider vinegar, white miso paste, onion powder, and garlic powder to a blender and combine until smooth. Add the dill and crumbled tofu if using, and pulse a few times, or stir to combine. Store in an air-tight jar in the fridge for up to one week. It may separate a little when stored, so just give it a stir to recombine before dressing your salad. Nasty cold these past four days (today being included in that), but finally wanting more than just soup. Was planning on something Asian or Asian-inspired, but San Francisco’s screwy October weather decided to change my mind (seriously, 80°F+ on October 15th?? ), so a salad it is! Spring mix topped with sliced cucumbers and julienned shallots left to pickle a bit in apple cider vinegar and black pepper, seasoned sourdough croutons, sunflower and sesame seeds, vegan “bacon” bits, and what better to dress it up with? 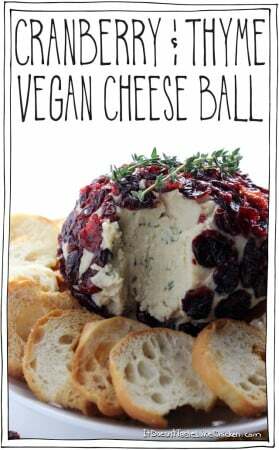 I immediately thought of your blue cheese. I’ll use the vinegar from the cucumber & shallot pickling so as not to let it go to waste and whip up a batch. I’ve not had it before, but will definitely let you know how it all turns out! Serve this up with a mug of tomato soup and maybe some garlic toast? Sounds like dinner to me! Well, while it’s definitely yummy, it’s NOT QUITE blue cheese (as I remember it), but it’s close! I’ll have to experiment a bit for my personal tastes, but this is most definitely a solid base to work with! Thanks!! Okay, update…I let it sit overnight. All of those wonderful flavors mingled and co-mingled and did whatever chemistry thing they did and now? 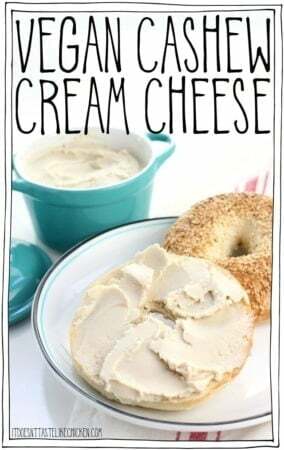 It’s very close to blue cheese, but almost a combination between it and ranch…I don’t know what to call it, but IT’S YUMMY!!! Definitely going to have to work on the “blue cheese” angle, but ooooo, this is good!!! Upgrading from 4 stars to 5! I made this dressing and followed the directions to a t (I didn’t include the crumbled tofu) and it turned out great! I was skeptical about the dill because it has a really strong flavor and wondered how that could mimic the flavor of blue cheese. 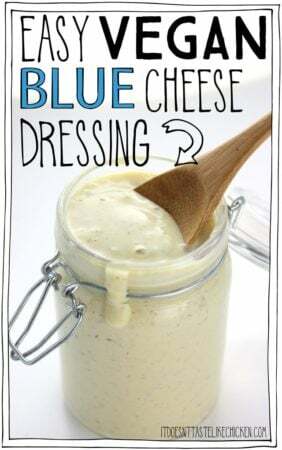 Somehow, the flavors combined to make what is the closest you can probably get to a plant-based, healthy blue cheese dressing. This is going into my “keep” files! My husband loves this dressing ! He likes it so much that he is now eating lettuce as a snack, instead of pretzels. You are either a wizard or my husband has been abducted by aliens !! Bahahahaah! Love it so much!!!! I would just leave it out. Enjoy! Just made this..but only had yellow miso. Pretty good, although I’ll do it the right way next time! Thanks! I look forward to trying it! You totally rock! Have you thought of doing meal plans? Your recipes are fun and doable and that’s what busy people want in a meal plan. I have seen some but the recipes haven’t inspired me to go to the trouble. I love your recipes and would be totally inspired to try a plan based on them! Keep up the awesome, mouthwatering work!! Thank you so much, Delia!! Yes! I have thought of meal plans. I have some ideas in the works but hope to start getting it together soon. 🙂 Glad you think it’s a good idea too! Just in time for summer! 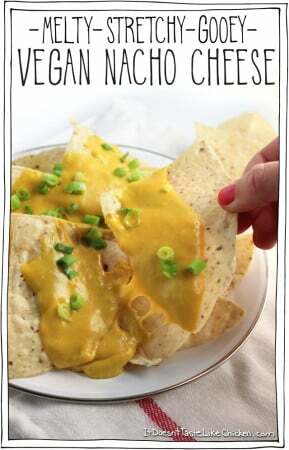 I love your dressings, especially your ranch dressing, but with vegan mayo as the base, they are high in fat. I can’t wait to use this and will use the same idea for other dressings. I try to keep small batches of marinated tofu “fingers” or cubes in the freezer so I can quickly pan fry and throw in a salad and top with one of your dressings. Amazing!! I hope you love my little hack, Joanne. 🙂 If you try to adapt other dressings you may need to up some of the other seasonings as the tofu doesn’t have as much oomph as mayo. Enjoy! Oooo I can’t wait to try this!! I love a good healthy dressing recipe! I can’t wait to try this. I LOVE THIS BLOG (AND COOKBOOK). Just this morning, we had tofu scrambled eggs and I made apple muffins and banana bread. For lunch, we’ll be having leftovers from the recipe for burrito bowl we had on Friday–and yesterday we had leftovers from the sweet potato pot pie. I love that this is all real food! This makes it so easy to be vegan. Thanks!